Fall Full Moon Falls As Sun Rises To Keep It At Bay At Tampa Bay – IMRAN™, a photo by ImranAnwar on Flickr. I had happened to pull an all-nighter in Florida to finish work on a project before catching an early flight to NY. But just as the sun was rising behind me, I saw a beautiful fall full moon still clearly shining in the sky falling to the West over Tampa Bay. This photo was taken with a 41MP Windows Phone Nokia Lumia 1020 cell phone. It is a great camera but one thing it does is try to lighten dark photos. That is great for indoor dark scenes but in this case it tried to “help” by making the scene lighter, easier to see, but taking away the rich tones I was seeing. I enhanced the photo by darkening it back in Photoshop to bring it closer to what I saw that day…. 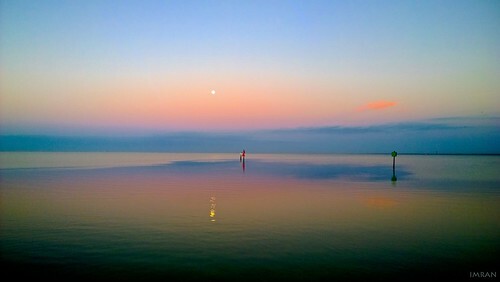 “Fall Full Moon Falls As Sun Rises To Keep It At Bay At Tampa Bay”.